Alpha Jane (Fritz) Bledsoe, 90, of Sullivan, passed away Friday, January 25, 2019. She was born on December 14, 1928, to Russell and Alma Inman Bledsoe. 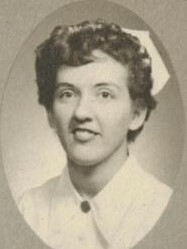 She graduated from Union High School and Union Hospital School of Nursing. Fritz was a nurse at Union Hospital for over 30 years. She loved her family, her horses and her dogs and cats. She was preceded in death by her parents, sisters and brothers: Betty, Kenneth, Mary, Lois, and Paul. She is survived by her brother Jack Bledsoe. She was the legal guardian and mother to nephews George (Anne) Sly, and Jerry Goodman, and niece Cheryl Goodman. She was a constant source of wisdom for her family. She was a spirited conversationalist and an avid reader. Fritz had a wonderful sense of humor. She was also a pie baker extraordinaire. A service will be held on Saturday, February 2, 2019, at 1:00 PM at Newkirk’s Funeral Home in Dugger, Indiana, with George Sly officiating. A visitation will be held from 11:00 AM until service time on Saturday. A private burial will be held at Long’s Chapel Cemetery at a later date.